Summer and fall cases, especially if in a cluster or outbreak, suggest arboviruses or enteroviruses. History of exposure to mosquitoes suggests arbovirus infection, especially in geographic areas of high endemicity (eg, swamps of Florida). Maculopapular rash suggests enterovirus disease. Lymphocytic pleocytosis in cerebrospinal fluid (CSF) with normal glucose and protein concentrations suggests viral meningitis. 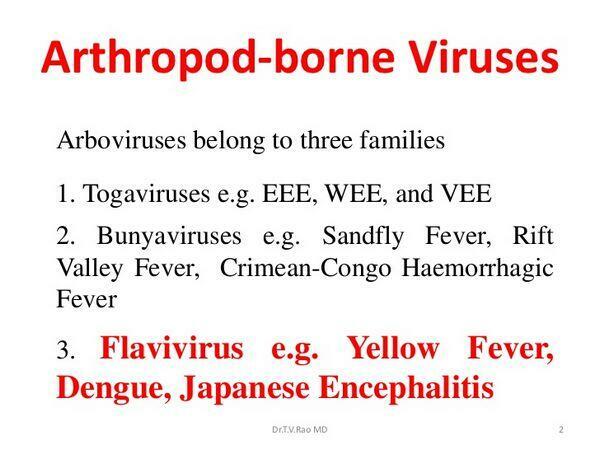 Arthropod-borne (arbo) viruses causing encephalitis are members of the toga-, flavi-, and bunyavirus families. The medically important togaviruses include rubella virus, which is discussed in site, and the equine encephalitis viruses. The flavivirus family, which includes St. Louis encephalitis (SLE) and West Nile viruses, also includes dengue and yellow fever viruses; the latter described in detail in site. 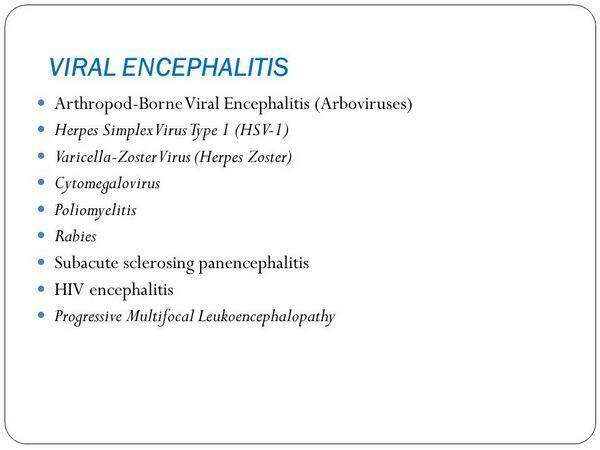 The bunyaviruses causing CNS disease are members of the California encephalitis (CE) virus group, but other pathogenic bunyaviruses include the hantaviruses, which are discussed in site. The older term, arbovirus, refers to those encephalitis-causing viruses that have an arthropod vector, eg, mosquitoes or ticks. These viruses have a very broad host range, including mammals, birds, amphibians, and reptiles. Togaviruses and flaviviruses are prototypical arboviruses. As arboviruses, they infect both vertebrates and invertebrates, and they initiate a viremia in a vertebrate host and a persistent, productive infection of the salivary gland of the invertebrate to provide virus for infection of other host animals. If the virus is not in the blood, the arthropod vector cannot pick it up. The infection cycle involves transmission of the virus by the arthropod vector and amplification in a susceptible, natural host to allow reinfection of other arthropods. Humans are usually dead-end hosts that cannot spread the virus back to the vector because a persistent viremia is not maintained. Table 43-1 lists vectors, natural hosts, and a geographic distribution for representative togaviruses and flaviviruses. These viruses are usually restricted to a specific genus of arthropod vector and its vertebrate host. The most common vector is the mosquito, but some arboviruses are also spread by ticks and sand flies. Not all arthropods can act as good vectors for each virus. For example, Culex quinquefasciatus is resistant to infection by western equine encephalitis (WEE) virus (a togavirus) but is an excellent vector for SLE virus (a flavivirus). As with mosquito-borne viruses, the life cycle of the tick dictates the pattern of spread of tick-borne viruses. In endemic regions, the risk of arbovirus infection increases during the rainy season. Pools of standing water, drainage ditches, and sumps in cities can provide breeding grounds for mosquitoes, such as Culex spp., the vector of SLE and West Nile virus. During the summer months the arboviruses are cycled between a host (eg, bird) and an arthropod (eg, mosquito). This cycle maintains and increases the amount of virus in the environment. In the winter neither the normal host nor the vector remains to maintain the virus. The virus may persist in arthropod larvae or eggs or in reptiles or amphibians that remain in the locale, or it may be blown by the winds or migrate with the birds and then return during the summer. Birds and small mammals are the usual hosts for the togaviruses and flaviviruses, but reptiles, amphibians, and, rarely, humans can also act as hosts. Development of a large population of viremic animals can occur in these species to continue the infection cycle of the virus. Although some of these viruses are called equine encephalitis viruses, the horse sometimes is a dead-end host. However, as with humans, the horse may develop clinical disease. 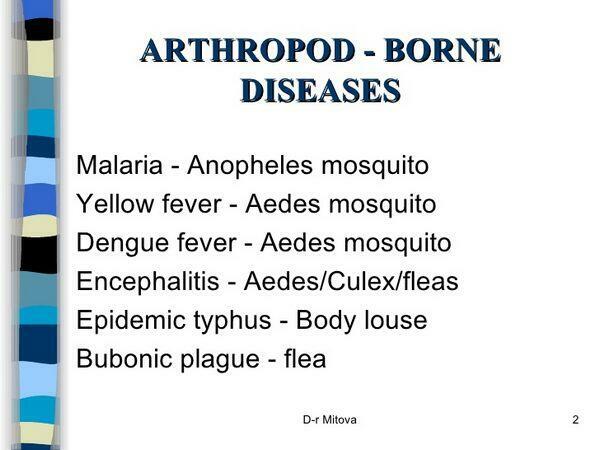 CE viruses are arthropod-borne members of the bunyavirus family. Bunyaviruses were known as arboviruses until the discovery of hantaviruses, members of the family that are transmitted to humans without the aid of arthropod vectors. Despite its name, CE occurs almost exclusively in the eastern half of the United States and especially in the North Central States. The name derives from the fact that the first representative of this virus group was isolated in Kern County, Calif., but the most common type causing disease in the United States is the La Crosse virus, which was first isolated in Wisconsin. This virus causes the most prevalent arbovirus infection in children in the United States. The age distribution of patients with arthropod-borne encephalitis is striking. SLE and West Nile virus cause clinical illness in older adults, CE in school-aged children, and western and eastern equine encephalitis (WEE and EEE) predominately in infants and young children. The toga- and flaviviruses are enveloped, single-stranded ribonucleic acid (RNA) viruses. Until recently the flaviviruses were included in the Togaviridae family, but differences in size, morphology, gene sequence, and replication have made it necessary to classify them as an independent virus family. The flaviviruses also have plus-strand RNA and an envelope. However, the virions are slightly smaller than those of the togaviruses (37-50 nm in diameter). All the flaviviruses are serologically related, and antibodies to one virus may cross-neutralize another virus. CE viruses are intermediate-sized RNA viruses (90-120 nm in diameter) in the bunyavirus genus that are spherical in appearance. They are enveloped and contain three separate pieces of negative-strand RNA of differing lengths. The togaviruses and flaviviruses can cause lytic or persistent infections of both vertebrate and invertebrate hosts. Infections of invertebrates are usually persistent, with continued virus production. Female mosquitoes acquire the togaviruses and flaviviruses on taking a blood meal from a viremic vertebrate host. The virus infects the epithelial cells of the mid-gut of the mosquito, spreads through the basal lamina of the mid-gut to the circulation, and then infects the salivary glands. The virus sets up a persistent infection and replicates to high titers in these cells. The salivary glands can then release virus into the saliva; however, certain strains of WEE virus are limited to the mid-gut and cannot infect the salivary glands. After biting a host, the female mosquito regurgitates virus-containing saliva into the victim's bloodstream. The virus circulates freely in the plasma and comes into contact with susceptible target cells such as the endothelial cells of the capillaries, macrophages, and monocytes. Following replication of the virus in these cells, the initial viremia produces systemic symptoms such as fever, chills, headaches, backaches, and flulike symptoms within 3-7 days of infection. Some of these symptoms can be attributed to the interferon produced after infection of these target cells. This is considered a mild systemic disease, and most virus infections do not progress beyond this point. After replication in cells of the reticuloendothelial system, a secondary viremia may result. This can produce sufficient virus to infect target organs such as the brain, liver, skin, and vasculature, depending on the tissue tropism of the virus. Access to the brain is provided by infection of the endothelial cells lining the small vessels of the brain or choroid plexus. The vertebrate-invertebrate cycle of CE viruses is very similar to that for toga- and flaviviruses and includes Aedes triseriatus as the vector mosquito and the squirrel or chipmunk as the usual host. Infection by the togaviruses usually causes a low-grade disease characterized by flulike symptoms (ie, chills, fever, rash, and aches) that correlate with systemic infection during the initial viremia. 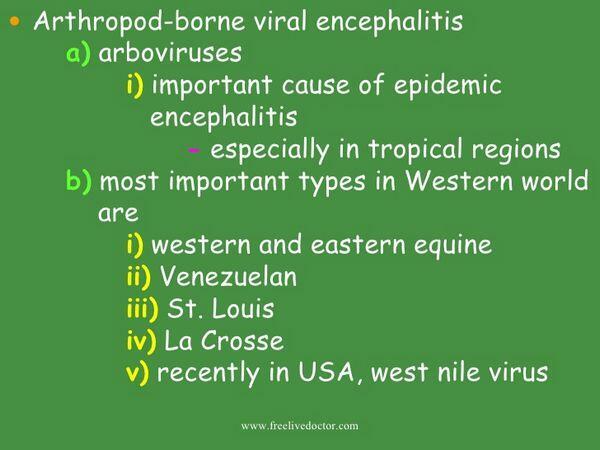 EEE, WEE, and Venezuela equine encephalitis (VEE) virus infections can progress to encephalitis (as the names imply) in humans and horses, with EEE causing the most severe disease. These viruses are usually more of a problem to livestock than to humans. Most infections with flaviviruses are relatively benign, although encephalitic or hemorrhagic disease can occur. The encephalitis viruses include St. Louis, Japanese, Murray Valley, and Russian spring-summer viruses. Infections with West Nile and other viruses usually are limited to a mild systemic disease, possibly with a hemorrhagic rash, but the 1999 outbreak on the East Coast of the United States with cases of fatal encephalitis underscores the potential severity of infection with West Nile virus. Inapparent, mild illnesses or aseptic meningitis occur with CE virus infection, the latter after an incubation period of approximately 48 h. Encephalitis caused by CE occurs approximately 1 week after exposure and is manifested by seizures and generalized cerebral dysfunction mimicking herpes simplex encephalitis. It is most common in school-aged children. The togaviruses, flaviviruses, and CE viruses can be grown in both vertebrate and mosquito cell lines but are difficult and dangerous to isolate. When isolation of the virus is necessary, the best systems are suckling mice and mosquito cell lines. In addition to cytopathology, the viruses grown in culture can be detected by immunofluorescence or by hemadsorption of avian erythrocytes. After isolation, the viruses can be distinguished by analysis of the genomic RNA or by monoclonal antibodies. A variety of serologic methods can be used to diagnose arbovirus infections. Seroconversion or a fourfold increase in titer between acute and convalescent sera is used to indicate a recent infection. The serologic cross-reactivity between viruses in a group or complex limits identification of the actual viral species in many cases. Magnetic resonance imaging (MRI) may help to distinguish HSV encephalitis from other types; HSV characteristically causes temporal lobe lesions, whereas arboviruses cause focal lesions in basal ganglia and thalami. The arthropod-borne encephalitides are similar to each other, but the specific etiology may be suggested by geographic location and age of the patient as well as the severity of the illness. For example, WEE is more apt to occur in the far western United States, Colorado, and Texas; EEE is endemic along the entire East Coast; SLE in the eastern states, Texas, and Mississippi; and CE in the Midwest. The 1999 outbreak of West Nile virus infections in New York was originally thought to be due to SLE, but this virus is now endemic in the Eastern United States. West Nile attacked adults and had a fatality rate of 10%. WEE has its highest attack rate in infants < 1 year of age and is most severe in this age group. EEE is more severe than WEE, with a mortality rate of = 20% in infants and children. SLE is similar in severity to WEE, with 5% mortality in those with encephalitis, but SLE tends to attack adults rather than infants or children. CE, in contrast, attacks patients aged 5-18 years. Arbovirus encephalitis must be distinguished from that caused by herpes simplex viruses (HSV, VZV, and EBV), especially since the latter infections can be treated with antiviral agents. Herpesvirus encephalitis occurs sporadically without any seasonal pattern and occurs with or without mosquito exposure. HSV and VZV encephalitis may be preceded or accompanied by characteristic vesiculopustular skin lesions. HSV tends to be localized to the temporal lobe, causing EEG and imaging abnormalities in this location. In infants < 1 year old with encephalitis, death may occur in up to 20% and neurologic sequelae in > 50% of survivors. The rates of these complications are less in older children and adults. No treatments exist for arbovirus diseases other than supportive care. Attack rates for encephalitis are approximately 1 per 1000 infections. In older children and adults, = 95% recover from encephalitis, and sequelae are uncommon, but in infants there is high mortality and frequent residua in survivors. The easiest means to prevent the spread of any arbovirus is elimination or avoidance of its vector and breeding grounds (Box 2). Killed vaccines against Japanese encephalitis, EEE, WEE, and Russian spring-summer encephalitis viruses are available. These vaccines are for individuals working with the specific virus or at risk of contact. A live vaccine against VEE virus is available but only for use in domestic animals.